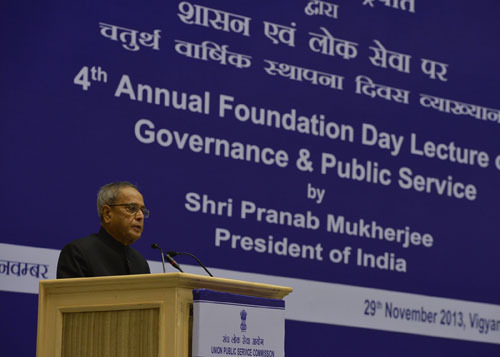 SPEECH BY THE PRESIDENT OF INDIA, SHRI PRANAB MUKHERJEE ON THE OCCASION OF FOURTH UPSC FOUNDATION DAY LECTURE ON "GOVERNANCE AND PUBLIC SERVICE"
It is indeed privilege for me to be present amidst this very distinguished gathering to deliver the Foundation Day Lecture of the Union Public Service Commission. I am glad to have this opportunity to share some of my perceptions about governance and public service on this occasion. A professionally managed public service is the edifice for good governance and responsive public service delivery. The need for an autonomous body to create merit-based civil services was felt even long before the Independence. The first Public Service Commission was set up in 1926 under the chairmanship of Sir Ross Barker. This Commission had limited advisory function. Subsequently, Federal Public Service Commission was set-up under the Government of India Act, 1935. It contained provision for formation of Public Service Commissions at the provincial levels. After India attained Independence, the Union Public Service Commission was set-up under Article 315 of the Constitution of India. The Constituent Assembly played a dominant and visionary role in granting Constitutional status to UPSC, as it realised the importance of having an autonomous body to provide for public administration based on professionally managed cadres of Civil Services. Speaking of the importance of this body, Pandit Hirday Nath Kunzru had said and I quote: "Its object, as has been stated by several speakers is to secure for the State efficient public servants who will serve all people equally and will always watch over the interests of all communities and the State as a whole” (unquote). The UPSC is the nursery of administrative ethics. It is the alma mater for selection of men and women of excellence, as officers in the service of the nation. Its role in human resource management of the Government is crucial as it has to recommend the best candidates from amongst the millions of aspirants. Over the years, UPSC has helped create a civil service which is diverse and representative, reflecting the pluralistic ethos of our country. The civil services play the vital role of reinforcing our democratic values. It also functions as an instrument of economic growth and social change. It assists the government in formulating and implementing policies for national development. The tasks and challenges of nation building require close interaction and cooperation between the civil servants and the people. It underlines the need for civil services to be foremost in their commitment towards the people. In the past six and a half decades since Independence, this nation has made rapid progress. Today, India stands at the threshold of global leadership in terms of political and economic evolution. The expectations of the nation have grown immensely as a result of economic success. Integration with the global trends and opening up of the economy has resulted in diversified challenges for the civil services. The success of our development programme depends on the quality of public administration. People want transparent and professional administration to take care of their needs efficiently. They want immediate disposal of their grievances. They expect the benefits of welfare measures to seamlessly reach the poorest of the poor. This calls for improving service delivery by adopting good governance practices. Governance is crucial for economic development, equity and social participation of various sections of society. An impartial and apolitical bureaucracy strengthens governance and contributes towards economic development and social transformation. The term, Good Governance, appeared in the development lexicon about two decades back. However, the concept has been in vogue since ancient times. As emphasized by Kautiliya in the ancient treatise "Arthashastra”, and I quote: "The happiness of the people is the happiness of the king; Their good alone is his, his personal good is not his true good; the only true good being that of his people: Therefore let the King be active in working for the prosperity and welfare of his people” (unquote). The essentials of Good Governance form the basis of Mahatma Gandhi’s vision of a strong and prosperous India or Purna Swaraj. Nations are according high importance to Good Governance because of its inseparable link to social welfare and inclusive development. Absence of good governance has been identified as the root cause of many of the deficiencies in society. It robs the citizenry of their social and economic rights. Good governance signifies basic parameters such as rule of law, participatory decision-making structure, transparency, accountability, responsiveness, equity and inclusiveness. The country’s public administration has to run on these principles. This necessitates a reorientation in the outlook of the civil services. Improving the governance standards calls for proactive measures. Governance and administrative reforms have been an evolving process needing a continuous dialogue with the final recipients of services. The Administrative Reforms Commission has provided a blueprint for improved governance. Transparency and accountability are two basic elements of good governance. Transparency refers to the availability of information to the general public and clarity about the functioning of governmental institutions. Transparency enhances predictability as it helps government organizations to function more objectively. It also enables and encourages the common man to effectively participate in the governance process. The Right to Information Act has made the administrative machinery more responsive and efficient in meeting the needs of the masses. There has been a paradigm shift in the developmental approach. Citizens have been provided security for food, education and job by empowering them through entitlements backed by legal guarantees. Implementing these novel initiatives call for robust delivery mechanisms. The Direct Benefits Transfer Scheme, launched in January 2013, leverages the Aadhaar system to usher in greater transparency and improve targeting, eliminate wastage and enhance efficiency. The Right of Citizens for Time Bound Delivery of Goods and Services and Redressal of their Grievances Bill, 2011 envisages the citizens to receive time-bound services. This would help create a more responsive administration to improve service delivery. E-governance has helped to change the outlook of the masses towards administration. Automation of government services has facilitated information dissemination. It has been successful in areas like land records management, law and order administration, pension disbursement and public information systems, especially relating to health and railways. The greater usage of internet has helped to integrate all areas of our country into the mainstream. However, despite achieving success on several counts, there are still many challenges for the governance system in our country. Corruption is one of the biggest factors that hinder efficient performance of the economy. There is need to eliminate interface in the delivery of services. It is also necessary to adopt non-discretionary approach towards decision-making and initiate two-way communication with the users. If we want our country to develop faster, we cannot afford to be slow in taking decisions. I am not saying that decisions have to be taken in a haste. But to prolong or avoid taking decisions is not aceptable. Informed decisions based on facts, figures and realistic assessment to the best of one’s ability are sine qua non for good governance. Public services have a lot to do for moving towards a globally competitive governance model for India. We have to develop our public administration into a dynamic and result oriented bureaucracy. I am happy at the introduction of objective targets for government departments and officers to monitor and improve performance. Governance is a holistic approach, involving all the pillars of the State, including provision of justice. The need for judicial reforms and initiation of measures like greater use of information technology to clear pending court cases is essential. Simplification of laws is also needed for better governance. Over the years, challenges before civil services have grown manifolds and have acquired multi-dimensional facets. I am glad that UPSC has introduced reforms in the process of recruiting civil servants, as a measure to create more responsive and modern civil services. These reforms will also provide a level playing field to all the aspirants coming from diverse backgrounds. The focus is now on evaluating the aptitude of the candidates for dealing with newer challenges on the basis of their decision-making capacity on ethical and moral dimensions. UPSC has rendered yeoman service to the nation in providing the foundations of our public administration. I take this opportunity to extend my heartfelt wishes to this great Institution and those who have served it. However, there is always scope for systematic and continuous improvement in service delivery to meet the heightened needs and expectations of the people. The need to inculcate the spirit of public service in the civil services would be the most essential ingredient for better governance and growth of the nation. With these words, I conclude. I once again thank UPSC for inviting me to this forum. I wish you all the very best.